Clash of Clans has been around since 2012 but that doesn’t mean that it’s had its day. The freemium mobile MMO strategy video game developed and published by Supercel remains a great way of spending your time but it can also be very frustrating. 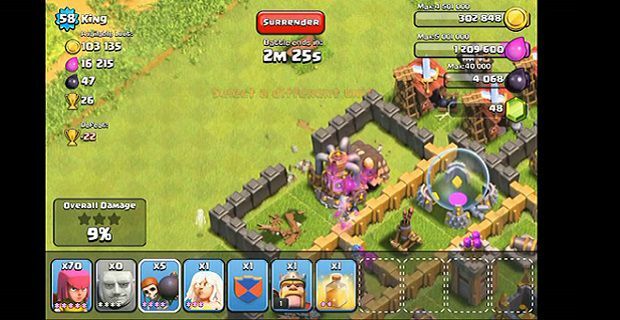 Read our tips on attacking in Clash of Clans and you’ll get more out of the game. Before we get started with specific tips that’ll help you attack in Clash of Clans, we’ve prepared a few dos and don’ts for newbies to the game. When you’re attacking you can lose some resources and trophies but your defences, buildings and walls aren’t in jeopardy during attacks as they pop back up without any penalties. This gives you licence to go out there and attack but which way’s best? When you attack you’re raiding to get supplies. Raiding allows you to increase your supplies without depleting your income. Of course there are risks so always attack with the smallest army feasible. Avoid the best protected mines and storage areas even though they’re really tempting. When you consider the costs of training your army, the cost to your gold and elixir supplies can be damaging when you raid with a large army that will take time to complete a major mission on Clash of Clans. Instead use a smaller army to carry out more missions per hour. That’s the most profitable way of getting on in the game. Do you want to play Top Gear Turbo Challenge games online?